Most people don’t associate clean water with oysters, but oysters may be just what New York City needs to clean its infamously polluted water. 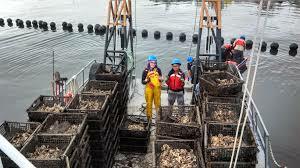 A non-profit organization, the Billion Oyster Project, is focusing on growing oyster reefs in the New York City harbor to revive the once thriving ecosystem and clear the water. The reefs can provide habitats for other organisms while the oysters work as natural purifiers. Small and powerful, a single adult oyster can filter up to 50 gallons of water in just one day. The oyster population used to be thriving in the waters around New York. In the past few years, the project has restored about 30 million oysters to the area. This is only a small fraction of what once was, but, recently, a significant increase of wild oysters have latched onto the reefs, showing promise for rapid population increase. Hopefully, the project will one day reach its goal of returning 1 billion oysters to the ecosystem. Billion Oyster Project has partnerships with over 70 restaurants in New York City, which save their used oyster shells instead of disposing of them. The shells are collected by BOP and left in the waters off of Governor’s Island for a year to allow them to be cleansed. Then, the shells are sent to the New York Harbor School, where high schoolers who are heavily involved with the project hatch baby oysters which attach to the shells. The project also engages with public schools across New York in other ways, like providing field trips to research stations and reef sites for students to learn about the project and its possibilities. The Billion Oyster Project is not the first initiative to take place which focuses on using the natural benefits of oysters to clean waters. A similar project was initiated in the 1990s to clean the waters off the coast of Virginia and Maryland. The Billion Oyster Project has a long way to go to reach its goal of returning New York’s waters to its once thriving oyster population, but its connection with the local community makes its stronger in its possibilities and likelihood to succeed.